I look into the large and deep eyes of my children. One whose eyes are as wide as an ocean, the other’s are as deep as a canyon and the thirds are the eyes of an old and aged soul. I look into those deep and soulful eyes and I know that sinking is easy, but swimming is more rewarding. It’s hard to admit out loud to those that don’t struggle, but it’s the truth; it’s easier to sink than swim. There is something beautiful and comforting in just allowing oneself to fall into the depths of darkness. Letting it engulf your being and circle you in it’s warm embrace. Swimming is hard. It gets tiring always clawing and pulling and swimming against the current. There is a sense of release, calm, relaxation that comes from just thinking about falling. Falling into the deep dark waters of depression. I skirt the edges frequently, if I’m honest for years. The alluring pull of those deep dark waters is hard to resist. It would be so easy, so easy to close my eyes and just fall in. Fall into the dark warm waters and let it cover me, let its warmth cover my body and the strength of it's current pull me down deeper and deeper. Sometimes I close my eyes and I think about it, dream of it it almost. Falling in, allowing it to take me over. Giving in to all those emotions that just want out, which essentially would shut me down. I think about divining into that dark ad swirling waters and never coming out. Because that would be easy, staying in those waters that confirm what the demons in my head tell me that would be easy. Swimming is what I was meant to do though. I'm meant to swim for them. So I pull and I push and I swim out of the deep. Everyday. I wrote this to the prompt deep,depth for our last Write Out Loud/Memoir Writing Circle. I was able to share it with other amazing writers and get their ideas and critiques and this is the final product. Would you like to have that kind of awesome experience? Whether you are "just" a blogger or have dreams of writing bigger the experience of a group Writing Circle is a benefit to your creative soul. Consider joining us! 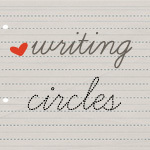 Bigger Picture Blogs Writing Circle - April 3 limited spots available! You can see two other pieces form the writing circle, very different form mine (that's the beauty of it!) at Undercover Mother and Alita Jewel's Treasures. Oh...these were words I was meant to read, because I have been there and I know that feeling too well. I say I've had victory over the worst of it, but there are still days that I struggle sometimes. Thank you for this reminder that it is always more worth it to swim than to sink. Oh you made me all teary-eyed. The Mix just read a report that people who have others in their lives live longer and this just sums up why.